Ｗe practiced debana kote, one of many techniques used in a Kendo match. One Kendo technique has different variations. By using one variation that fits well with the given situation, you can get one point, which could lead to winning. 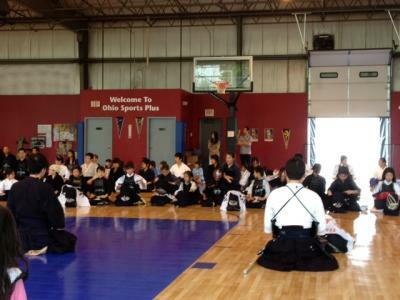 Kendo is a one-to-one match, and there is no "one-size-fits-all" technique that will work on every opponent. Some technique may work on a certain opponent, but not on others. Therefore, the more techniques you learn and master, the greater chance you can win. The technique to take the moment of hesitation from your opponent and to strike him or her before you get struck. The technique to counterattack the opponents' strike or thrust. "Men Suriage Men" is one of these Ohji wazas. "Debana Kote," is one among many shikake wazas. In this technique, you tempt the opponent to hit your men, and when the opponent's tip of shinai move up to hit your men, you make a small quick movement and hit the other's kote(wrist). You need to seize the moment when the opponent's tip of shinai slightly went up, otherwise your strike will be late. So you need to pay attention to your opponent's subtle movement. In your basic practice, try to master precise strike at men, kote and dou. Also, learn as many techniques as possible. We practiced "Nikyodo Men strike." In this practice, unlike usual Men strike, one raises one's shinai and then stops one's movement for a moment. 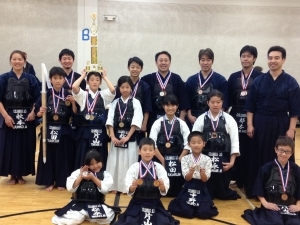 You do this in order to make sure that you have fully raised your arms to the extent that you cannot see your shinai. After you make sure, you make a strike. Using your entire arms, being aware of your elbows and sides, you raise your shinai all the way up with your back muscle, and then you bring your shinai all the way down. When you do this, it is important to raise your arms straight. The tip of your shinai should remain pointing at the center line of your opponent. This is a practice to make a big, neat movement. If you can correctly make a big Men strike, you will become able to make a small Men strike, with which you can get a point at a Kendo match. If you cannot make a big movement neatly, you cannot make a small, quick and accurate movement. Please understand the purpose of your practice, know what you are doing, and be focused when you do the practice. What do "omote" and "ura" mean in Kendo? When you and your opponent face with your shinai at the chudan position, you call the right side of your opponent's shinai omote, and the left side ura. To make an attack from omote is to make an attack on the "omote" side of your opponent, which means the right side of your opponent's shinai from your viewpoint, and the left side from your opponent's viewpoint. Then why do we call the two sides omote and ura, or the surface side and the hidden side? The answer to this question is related to the movement of the sun, as shown in the picture below. 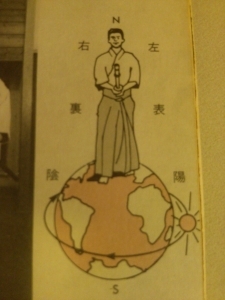 When one faces towards south, the sun will rise from the left side of one's body (=east side). This is why one's left side is called the surface side, or omote. The right side of your body --which is the west side in which direction the sun sets -- is called the shadowy hidden side, or ura. We will frequently hear these two words, omote and ura, in our practice in the future. Please make sure you won't forget these terms. See you at the dojo this weekend! Kiri-kaeshi (slash-and-flip) is an important practice that contains many factors necessary for excellent Kendo skills. By repeating Kiri-kaeshi practice, you will be able to master how to keep the right posture, how to flip your wrists, how to use both of your arms swift and sharp, the bodily balance right after the strike, how to breathe, etc. Kiri-kaeshi has four principles: Big, Strong, Fast and Light. "Big" means that you should swing your shinai big, with a shinai raised overhead. "Strong" means that you should strengthen the hold of both arms when you strike. "Fast" means that, when you sufficiently master the big and strong kirikaeshi, you should make it fast and sharp. "Light" means that you should be relaxed, without having any unnecessary tension, when you do the Kiri-kaeshi. Please have these four tips in mind when you practice Kiri-kaeshi!